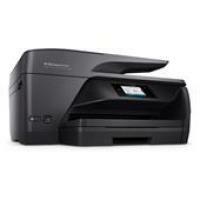 The HP OfficeJet Pro 6963 is a general purpose all-in-one printer which is efficient for performing high printing jobs. One can easily copy the documents, monitor the print jobs and manage the ink supplies, directly from the printer. With the considerate design features, replacement of the HP OfficeJet Pro 6963 ink cartridge doesn’t take too much time and it's easy to do. Designed for easy printing jobs, the printer supports wireless printing of photos which ensures that one can access the printer from anywhere in the house. It can print the photos at fast speed, thus making it popular between the users who want to print a large number of coloured documents in less time. With the high printing speed, the printer cannot promise good print quality. One might receive moderate quality prints with the OfficeJet Pro 6963 printer. By maintaining a decent standard of printing, the printer has easy setup options and does not require much time on installing the printer. Reliable and perfect for everyday home and office work purpose, this printer can be easily accommodated in any space. HP OfficeJet Pro 6963 printer comes with a sleek design and is ideal for printing high-quality documents. It is perfect for everyday office work purpose and support duplex printing which makes it easy to print the documents in less time. However, the printer does not have ethernet or fax port connectivity but makes a good choice for businesses with heavy printing jobs. What causes the ink to dry up and what can be done to fix the dried ink cartridges? Dried ink cartridges can completely stop the printing process and it can become a real problem for those people who use it rarely. In some case, you might need to replace the whole ink cartridge. The points given below will help you in maintaining the health of the HP OfficeJet Pro 6963 ink cartridges. Always ensure that your printer is kept in a suitable environmental condition as the variation in temperature can affect the performance of the cartridges. Carefully refill the cartridges. If it's not done properly, it can lead the air to get into it and eventually dry up the ink and clog the nozzle heads. Cartridges do have an expiration date and using them after it can lead to printing problems. We recommend you to never store the HP OfficeJet Pro 6963 ink cartridges for longer than 12 months. Make sure to store the cartridges in a cool, dry place far from the direct sunlight. You can also avoid the problem of dry ink by printing more frequently or by regularly cleaning the nozzles. Perform printhead cleaning in your printer settings. You need to perform cleaning at least for four to five times. Remove the cartridge from the printer. Place the dried cartridges in a bowl full of lukewarm water, so that the printer head gets immersed in it completely. You can also use a cotton bud (soaked in warm water) and rub it across the cartridge, that will help in cleaning the ink from the cartridge. Clean the dried nozzles with a paper towel or lint-free cloth and place in the printer. After this, perform printhead cleaning again. If it does not help, we recommend you to buy a new one. If cleaning the printhead still gives you unsatisfactory print results, there might be a problem with the cartridges. We recommend you to buy the HP OfficeJet Pro 6963 ink cartridges from our site at the compatible price range. Q. Is it possible to print with HP OfficeJet Pro 6963 All-in-One printers using a Windows 10 mobile? Make sure that the printer and the mobile device are connected to the same Wi-Fi network. Open the document or image that you wish to print and tap on the print icon. You will see a print preview screen where you can make changes to the print settings, if required. Select “Print” to initiate the print job. Q. I am looking to buy some ink cartridges for my HP OfficeJet Pro 6963 All-in-One printer. However, I cannot decide whether to buy compatible ink cartridges from this website or use original ink cartridges for my printer. What is the difference between the two? A. The main difference is that original ink cartridges are manufactured by the printer company itself. Whereas, compatible ink cartridges are designed and manufactured by third-party companies, for your printer. If you opt for our compatible HP OfficeJet Pro 6963 ink cartridges, you will be saving on your operating costs without having to compromise on performance and quality. We guarantee that you will not be disappointed when using our compatible ink cartridges. Q. What is the benefit of having a duplexer? A. A duplexer allows the printer to print on both sides of the paper. This feature comes is useful when printing booklets, calendars etc. HP OfficeJet Pro 6963 All-in-One printers come with an automatic duplexer, which will print on both sides of the page without requiring any human effort to flip the pages. This feature helps save a lot of time and effort. Q. Is it better to buy HP OfficeJet Pro 6963 ink cartridges in a multipack, or to buy each of them individually? A. Buying ink cartridges in multipacks may be beneficial depending on your usage. If you are a heavy user of the printer and require regular replacements, then it is better to choose multipacks. This is because multipacks are comparatively cheaper than buying all the ink cartridges individually. If you are an occasional user, it is better to buy the ink cartridges as and when required. It is advised to do so because, if the ink cartridges are not used for a long time, their ink may dry up and thus affect print quality. Q. How long would it take for the HP OfficeJet Pro 6963 ink cartridges to be delivered to me in Belfast? A. We will deliver the ink cartridges to you within 1 - 3 days. If your order is urgent, please contact us on 048 30833221. We will check stock and dispatch the item as fast as possible.